Condemns UC administration’s disregard for free speech, obedience to external pro-Israel interests, and bias against pro-Palestine activists; demanding stronger administrative statements condemning all forms of repression of Palestine solidarity activists on campus and commitment to principles of inclusion and diversity based on ideas of social justice, racial equality, free speech and civic engagement. By now, every student has heard the critiques before. We’re lazy. We’re entitled. We don’t want to take our eyes off our Facebooks or our butts off our couches. Yeah, we know. We have been engaged in the world around us, making our voices heard by engaging in electoral politics and protesting when the political system didn’t listen. Nowhere was this more evident than during ASUCR’s recent meeting that discussed divestment. The senate chambers could not accommodate the turnout, so the meeting was moved to UNLH, UCR’s largest lecture hall. Over 150 students spent five hours during a week filled with studying and midterms to debate the merits of divestment. Students held posters high. Students made their case to their elected representatives. In short, students did exactly what participatory democracy expects of its citizens: We participated. …Let’s not let the energy surrounding divestment be a once-in-a-blue-moon occurrence. 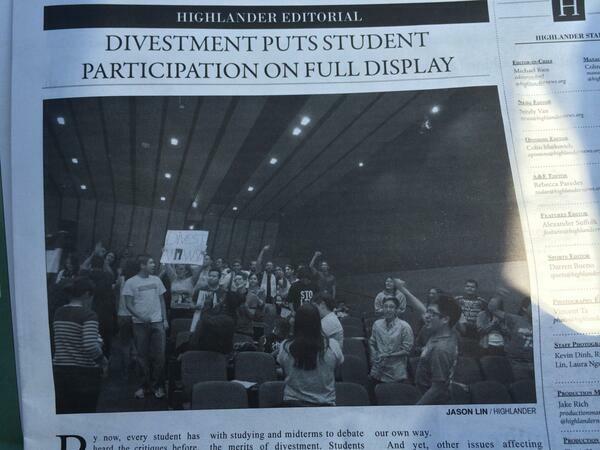 The momentum of dialogue and conversation cannot cease with divestment. It must continue forward, with students carrying the banner to advocate for the issues they find important. Students can effect real change. We just have to be tenacious and energetic enough to seek it in the first place. Your vote in support of “Divestment from companies that profit from apartheid” was an important statement of principle. The fact that companies are profiting from Israeli apartheid in the occupied Palestinian territories and comfortable with dozens of discriminatory laws within Israel is appalling. I have seen the deeply troublesome apartheid conditions that Israel has created inside the West Bank with the dual standard of law that discriminates against Palestinians. It is unacceptable. I urge you to stand firm for equality and human rights — as well as against racism, Islamophobia, and anti-Semitism — and not to backtrack on your courageous vote. Just as we defeated apartheid in South Africa so can we defeat Israel’s brand of apartheid and help Palestinians and Israelis alike secure a future of peace and equality. Your vote is not insignificant. It is votes such as yours that created the wave of momentum toward freedom in South Africa and sped up that glorious day of justice and equality in my homeland. The same thing can happen again today in securing freedom for Palestinians. Do not stand silent. Do not retreat. Do not back down. Stand firm in your principles and reject apartheid wherever it is practiced. Your courage is admirable as you put your university on the right side of history. Many congratulations on passing a bill calling for divestment from corporations that abuse human rights in occupied Palestine. You are part of the growing, non violent, resistance, in global civil society to Israel’s many violations of international law. I just heard on the grapevine that there will be an attempt to hijack and reverse the bill by the pro Israel lobby at a meeting tonight. That sentiment includes The Palestinian and Israeli peoples, it includes Rachel Corrie, killed by a Caterpillar bulldozer, and all the other victims of the occupation on both sides. You are part of the first stirrings of protest, not against Israel, not against the Israeli people, not against Jews, but against the illegal, unjust, immoral,and inhumane policies of the Israeli government. I am proud of you and stand with you in solidarity. I am an Israeli Jewish citizen. I have been active in the campaign against my government’s apartheid policies for many years. I am also the descendant of Holocaust survivors from Europe. My activism is based, to a large extent, on the universal lessons which should be drawn from this dark episode of history. One of the lessons I have learned during years of activism here in Israel is that Israel’s human rights violations against the Palestinian people are a part of an international power structure, In particular, these violations are sustained by the complicity of American companies, such as Caterpillar and HP. I strongly believe that companies which profit from the misery of millions (not just in Israel/Palestine) should be the target of divestment. I also believe that universities should be held to high ethical standards when it comes to their investment. In view of this, I would like to express my strong support for the Riverside divestment initiative. I hope that supporters of equality and justice for the Palestinian people will stand firm in the face of Israeli propaganda efforts, which often involve the cynical use of the Holocaust to justify Israeli apartheid. Israel advocates upset about the recent passage of a divestment resolution at the University of California at Riverside have launched an intimidation campaign against the student senators who voted in its favor. Members of the UC Riverside student senate have been inundated with calls and emails by Israel-aligned individuals and members of on-campus Zionist student groups following the passage of the resolution, who are claiming that the senators “misrepresented” the student body and that the resolution has made the campus atmosphere “more divisive,” according to a student senator who spoke to The Electronic Intifada by phone on Tuesday evening. In turn, it was recently announced that the student government has agreed to vote on to rescind the divestment resolution tomorrow (Wednesday) evening. If the vote passes with a majority, the divestment resolution will be up for a new vote all over again. On 6 March, UC Riverside’s Associated Students resolved to urge the University of California’s treasury and administration to pull its current investments in companies which profit from Israel’s occupation. A week later, a similar resolution was passed by the student government at UC San Diego (and, following that, on 25 March, another divestment resolution was passed by the undergraduate student union at York University in Toronto, Canada). In California, since the UC Board of Regents — which is connected to the state government — controls the investments of the University of California system, and the Regents have no plans at this point to change their investment policies, these resolutions are mostly symbolic. But as more divestment resolutions pass, they become, as EI’s Ali Abunimah put it, “another indicator of growing support for divestment among students, which is why Zionist groups have vigorously opposed such resolutions whenever they have been proposed and have supported draconian measures to suppress student activism at the University of California and other campuses.” Zionist organizations even recruited two local members of Congress to write letters asking student senators to vote against the resolution at UC San Diego. Ahlam Jadallah, a student senator at UC Riverside and a member of the university’s chapter of Students for Justice in Palestine, whose members were some of the main authors of divestment resolution, told The Electronic Intifada on Tuesday that members of Zionist organizations on campus were employing “scare tactics” and making the senate “feel that they had made the wrong decision” by passing the resolution. She explained that she hopes her fellow student senators stay committed to the vote they passed last month. Being neutral is divestment. Because right now, we currently invest in only one side of this apparently two-sided conflict, in their eyes. And that the solution was either to begin investing in Palestinian companies, which is obviously not feasible, or to disinvest from both sides and stay completely out of it, by the choices of students — which it was. WHEREAS, South African apartheid was ended by a large movement of student governments across the United States and college systems world wide. WHEREAS, let it be known that the University of California Riverside is a state funded school that is part of the state of California and thus a part of the United States who support the state of Israel. WHEREAS, since the University of California Riverside is a public university, an environment of neutrality must be maintained in issues of high conflict. WHEREAS, let it be known that resolutions regarding divestment of student funds only apply to funds/fees given to the UC system and disbursed to the University of California Riverside.